Xenophon (ca. 430-355 B.C.) - The third of Greece's prominent historians from the Classical Period, Xenophon picks up roughly where Thucydides leaves off. So thanks to the works of Herodotus, Thucydides and Xenophon, and the time spans in which they wrote, we have a fairly comprehensive account of Classical Greece from the Persian Wars almost up to its conquest by Macedon. Unfortunately, his work is widely regarded as tainted by his own personal biases and cannot be considered nearly as credible as that of Thucydides, nor even of Herodotus. Still, it's about the only contemporary account we have from end of the Peloponnesian War up to the Battle of Mantinea (a very pivotal battle in Greek history), and so we are left to the mercy of his work. Despite being somewhat lacking, Xenophon was a voluminous writer. His account of the aforementioned events in Greece, is called the Hellenica. Even more famous is his Anabasis, a chronicling of his expedition into Persia as a mercenary of Cyrus the Younger, the brother of King Artaxerxes II of Persia. 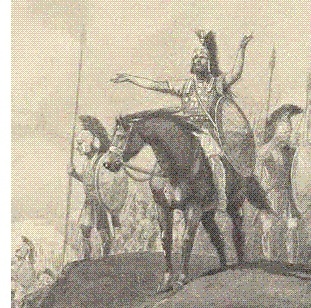 Cyrus tried to overthrow Artaxerxes and hired 10,000 Greek mercenaries of which Xenophon was one. This took place at the close of the 5th century B.C.. The expedition concluded in 401 at the Battle of Cunaxa near Babylon. Cyrus won a tactical victory but was killed in the conflict, basically making any further expedition by the Greeks pointless. Stranded in the middle of Mesopotamia, they decided to fight their way north to the Black Sea, where a number of Greek colonies existed, and then turn west and make their way back to friendly territory. Again, not considered a critical historical work, it is nonetheless regarded as a great adventure and struggle for survival. Xenophon was also a student and admirer of Socrates, and much of what we know of him comes from the historian.